What Would Peter Say? - Harvard Business Review by Rosabeth Moss Kanter, from the November 2009 issue of the Harvard Business Review. 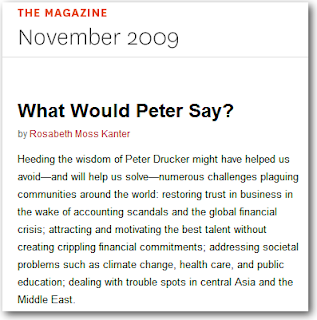 Peter as in Peter Drucker, legendary management guru, and considered by many as the father of modern management. Management professor Rosabeth Moss Kanter argues that many of Peter Drucker's advice on management would be readily relevant today, especially in the context of the many challenges faced today by society - from the erosion of trust in corporations, to employee motivation and retention, and more.She states that Peter Drucker foresaw the problems at GM. The siloed structure at GM helped it become the leader in the American automotive market, yet the same structure became ossified and prevented GM from addressing the challenges posed by a changing market. According to Kanter, Drucker also foresaw the rise of emerging markets, primarily Japan. She credits Drucker, perhaps a bit too much, with helping third world countries create a middle class, writing "He gave leaders in those nations the concepts and permission to move from tribalism to corporatism ... helped create a middle class and transformed political regimes". One would like to see such claims backed by more evidence than is available from the article. A bit of over-enthusiastic hyperbole, perhaps? The article serves as a useful though short summary of Peter Drucker's achievements, his far-sightedness, blind spots, shortcomings, and the gist of his thoughts on management.